Eating spicy foods, such as pizza, may cause a person to feel heartburn. Although the name may imply the heart, heartburn has nothing to do with the heart itself. Heartburn is pain felt in the chest by a burning sensation in the esophagus, which is located close to where the heart is. Here you can see the pizza passing from the mouth to the esophagus and on to the stomach. 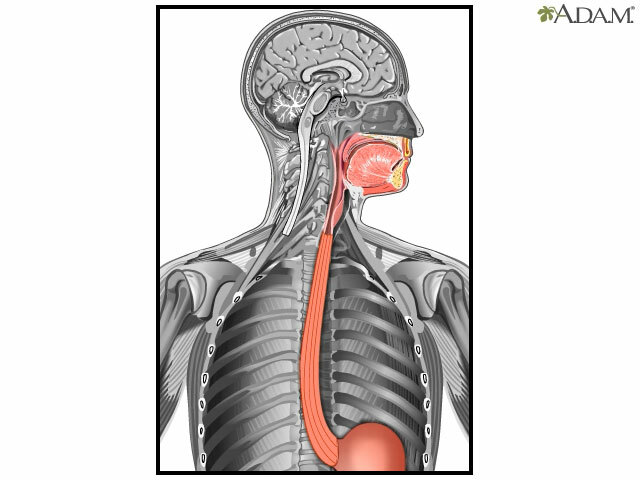 At junction between the stomach and esophagus is the lower esophageal sphincter. This muscular sphincter acts as a valve that normally keeps food and stomach acid in the stomach and prevents the stomach's contents from regurgitating back into the esophagus. However, certain foods may affect the lower esophageal sphincter, making it less effective. That's how heartburn begins. The stomach produces hydrochloric acid to digest food. The stomach has a mucous lining that protects it from hydrochloric acid, but the esophagus does not. So, when food and stomach acid regurgitate back into the esophagus, a burning feeling is felt near the heart. This feeling is known as heartburn. Antacids may be used to relieve heartburn by making stomach juices less acidic, therefore reducing the burning feeling felt in the esophagus. If heartburn becomes frequent or prolonged, medical intervention may be necessary to correct the problem.